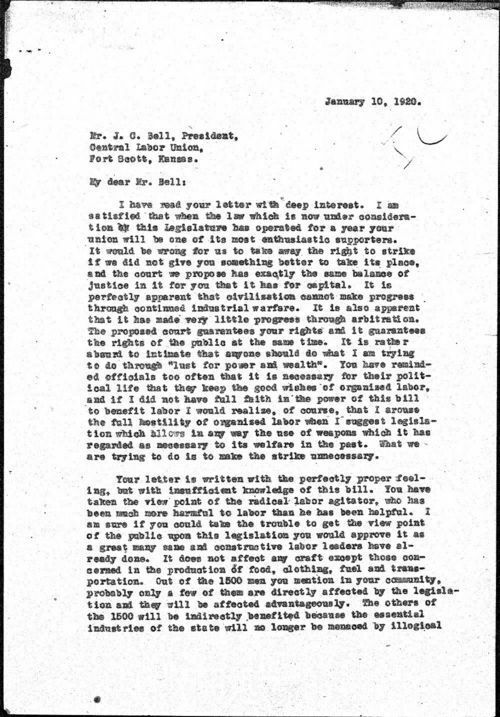 In this letter Kansas Governor Henry Allen, of Topeka, writes to J.C. Bell, President of the Central Labor Union. Governor Allen seeks to win the support of the labor unions in proposed legislation that creates a court of industrial relations. The governor has called a special session of the legislation to create an entity where labor disputes can be settled in a fair and civil manner. In this letter Governor Allen asks the labor leader to "take the trouble to get the view point of the public". The Court of Industrial Relations was signed into law in 1920 but dissolved a few years later when it was declared unconstitutional by the United States Supreme Court. Call Number: Governors Office Governor Henry Allen Box 11 File "B"